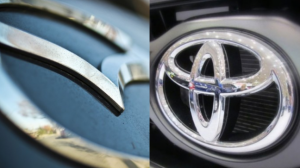 Toyota and Mazda have signed an agreement to enter a business and capital alliance, with the aim of further strengthening their lasting partnership. 1) Establish a joint venture that produces vehicles in the United States. 2) Jointly develop technologies for electric vehicles. 3) Jointly develop connected-car technology. 4) Collaborate on advanced safety technologies. In the capital tie-up, the two companies have also agreed that Toyota will subscribe for and acquire shares to be newly issued by Mazda through a third-party allotment, and at the same time Mazda will subscribe for and acquire third-party allocation shares of treasury stock disposed of by Toyota in the equivalent amount in value to the Mazda shares (shareholding ratio of 5.05% on an issued share basis after the capital increase; total value of 50 billion yen). The value of the shares mutually acquired by both companies will be equivalent.